This one story Craftsman Bungalow sits on the corner of University and Brockton Avenue. It has medium crossed gables. At the top of each gable is a vertical wooden vent. Three large brackets support each gable. One of the many interesting qualities of this house is the windows. A common window opens in; the top pane is multi-paned with two square panes on either side of a vertically rectangular pane. The bottom pane is plain with lug sills and plain wood trim below. Several interesting windows face north; an eighteen rectangular paned window with a rectangular fixed center window, a window with eighteen smaller panes with a square fixed center window, and a long slender window near the roofline. Garrett Huizing, a prominent builder in Redlands, constructed the homes in University Tract #1. 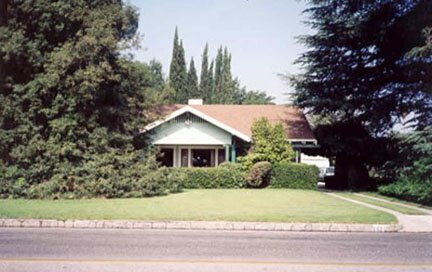 This home sits on two lots and was owned by the University of Redlands before the Cortners purchased the property in 1922. George P. Cortner was born in Tennessee and came to Redlands with his brother in 1902. They first lived in a tent on Washington St. and started their funeral home. In 1910 Cortner Brothers was located on 6th St. and Olive Ave. For three decades Mr. Cortner was Business Manager for the University of Redlands. He passed away in June of 1946 from an ailing heart. The Redlands Daily Facts paints this picture of his life. What impelled him to serve so generously and so long, for the U of R, was his unswerving faith in the rightness of liberal education under a strong Christian guidance. Many people of substantial means were encouraged by Mr. Cortner to give endowments that constructed buildings and helped get the young college started. He was very active in the Baptist church, presiding at one time head in Southern California. The welfare of Redlands also was ever close to his heart. He participated in civic affairs through the Chamber of Commerce, and municipal government. While Mayor, he helped to shape the growth of the town, always with a desire to make it a better place to live. Mature trees and shrubs shade the house from the hot sun. The east side of the house, or the front, has a gable over the cement porch. You enter the porch by short cement steps that face north and south. To the north is a wooden porte-cochere; cement piers support both the porte-cochere and the porch with three wooden square posts in a V shape. The back of the house is in a U shape with a patio in the center. Towards the back of the property is a pool and cement mural. The mural was painted in 1960 and depicts our mountains in the background, Indian tepees, and Indian playing a flute on the right, along the front are flowering yucca plants and the left side shows a large bear laying back and licking his lips. Artist, unknown, an F and the date are shown. When Mr. Cortner died in 1946 Mrs. Cortner moved to be near her daughter Kathryn in Pomona. She was living in Alhambra upon her death in April of 1961. She had another daughter Edith who lived in Los Angeles. Nellie Harman Cortner was born and educated in Delaware, Ohio. She came to California to join her parents in 1904. She married in 1905. Mrs. Cortner was active in the First Baptist Church, Faculty Wives of the U of R, a former member of the Contemporary Club, the PEO Club and the Cosmos Club. The house was rented until about 1955 when Joseph and Hetti Herz purchased the home. He was an engineer. They lived in the house until Sylvia and Harley Tillitt bought the home in 1963. Mr. Tillitt was born in the Del Rosa area of San Bernardino. He graduated from San Bernardino High School, as did his wife. They both went to the University of Redlands and graduated in 1937. Before WWII, Mr. Tillitt was involved with the Manhattan project (A-Bomb) at the University of California, Berkeley and at Oak Ridge Tennessee. After the war the U.S. Navy at China Lake, California employed him. He was responsible for establishing a center for scientific and technical computation. Mrs. Tillitt remained an educator and administrator and for twelve years the Principal of the Junior High School before leaving China Lake. While living in China Lake they would travel to Redlands to visit their two children, Jay and Kay, who were attending the University of Redlands. Upon one of these visits in 1963 they noticed a small for sale sign and at Mrs. Tillitt’s urging they inquired about the house at 1021 University. A few days later they decided to buy the home for when they retired. After retiring from the Washington D.C. area in 1979 they made their home in Redlands. Sylvia Payne Tillitt passed away on May 17,1994. In her honor Harley Tillitt had her poetry bound in a book called “Threads of Life: A Collection”. This book is in the Smiley Library. Redlands Area Historical Society wishes to express our gratitude to Sylvia and Harley Tillitt for their love of this historic property.